Hangry District went to China and ate as much as I possibly could -- in order to report back with the best possible knowledge of local cuisine. 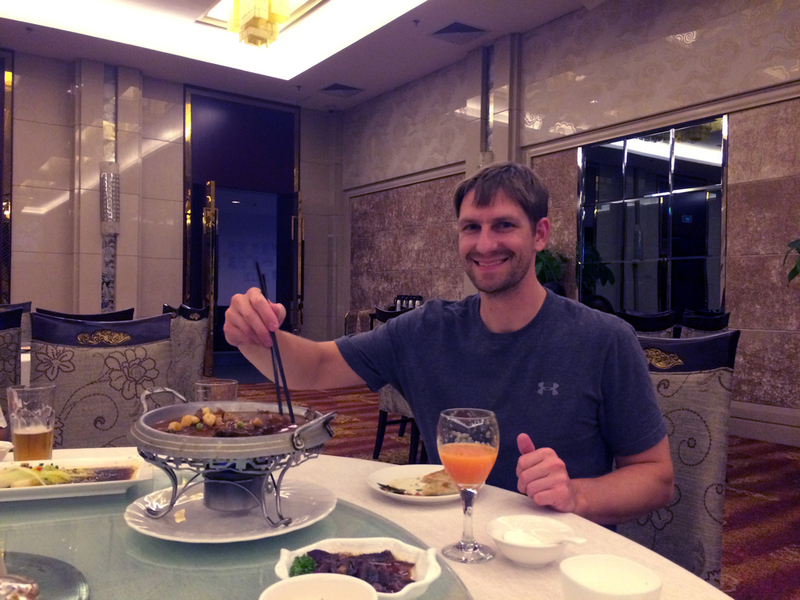 I hope you enjoy reading about my culinary travels in China. It was such an amazing trip and we were treated like royalty. If you have any questions or want to know more, just leave a comment below! Stay tuned for Part Two with more about our non-eating adventures and tips on traveling internationally! Xiéxié! One of our many offerings from the breakfast buffet. This was spicy marinated tofu, but the translations made us giggle! My favorite breakfast item was the dumpling/noodle station at the hotel buffets. Made to order noodle bowls or wonton soup, so delicate and delicious. Tim's favorite breakfast item was the individual made-to-order omelets. A fried egg patty is always delicious. A Chinese favorite with meals was warm corn juice. Reminded me of when my parents would cut corn off the cob for me when I had braces. Fresh and yummy! 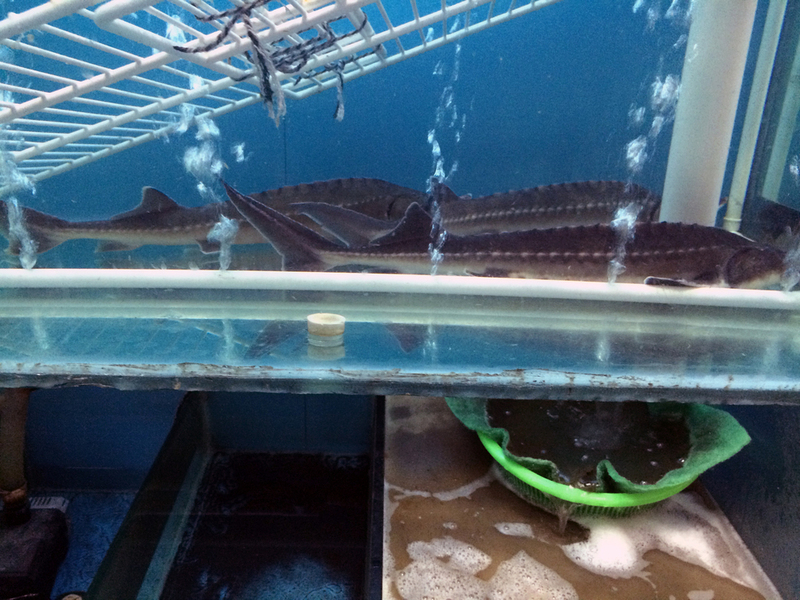 We picked this fish out from the tank in the front of the restaurant - so fresh! 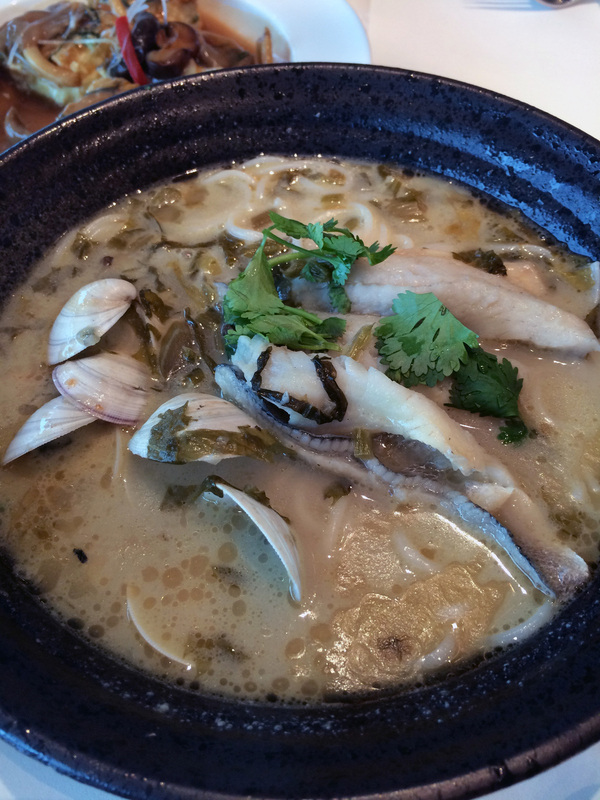 Served with house made noodles, chiles and warm broth. One of my favorite meals of the trip. Puffed cripsy corn cake (reminded me of a rice krispie treat), with shrimp and a mayo/cheese drizzle. Unlike anything I've had before. 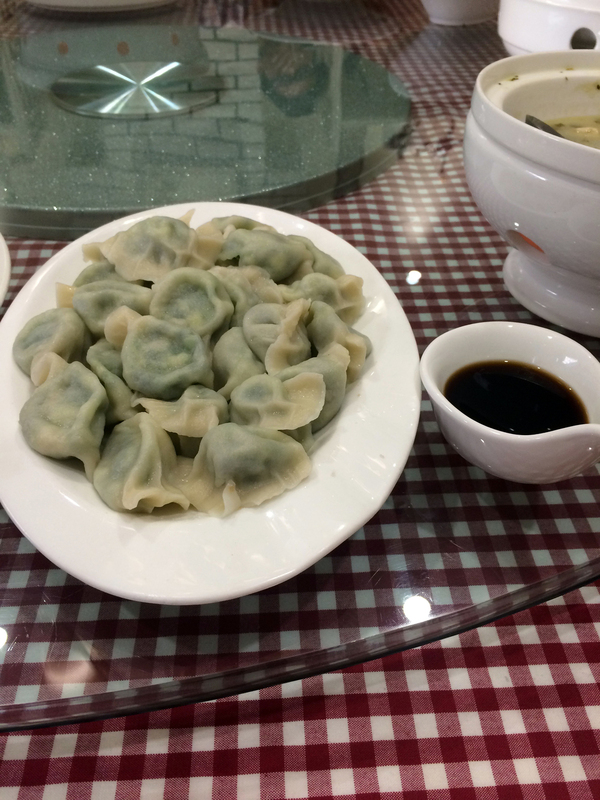 The first dumpling in China! 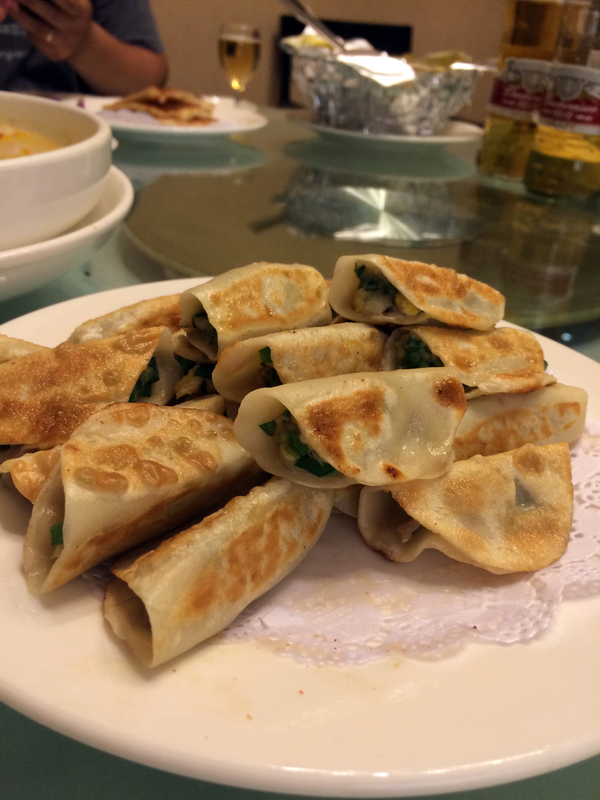 Dumplings are my favorite food and these were amazing, filled with shrimp and green onion. Baby cauliflower sauteed with red onion and chiles. A lot of dishes in Chinese restaurants are served over a flame to either continue the cooking process or keep it warm throughout the whole meal. I like this. 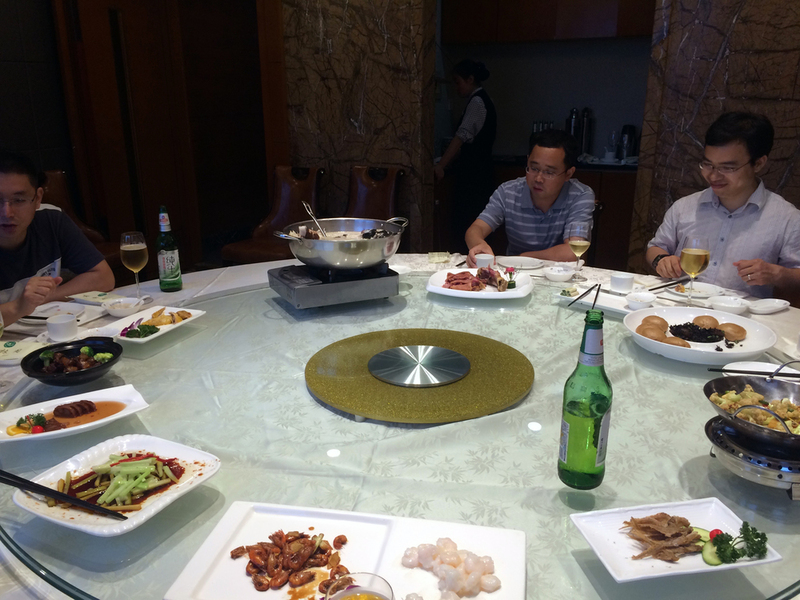 A typical Chinese restaurant will have private rooms and lazy Susan's on the tables. No water is served unless it's boiling, so the beer and wine flowwww. Crispy spicy baby whole shrimp, duck feet (more on that later), Chinese broccoli, sweet sticky rice filled lotus root, black fungus, boiled fish head stew, poached goose, wheat buns filled with fermented cabbage, soy bean rolls with greens, scallops. Ughh.. one of my least favorite things. Not because of the egg or the fact that you eat the shell, but because it tasted like I was eating a salt lick. Fish, fungus and boiled goose on the buffet this day. This was the translation for congee (porridge). My interpretation is that it's good for the soul. 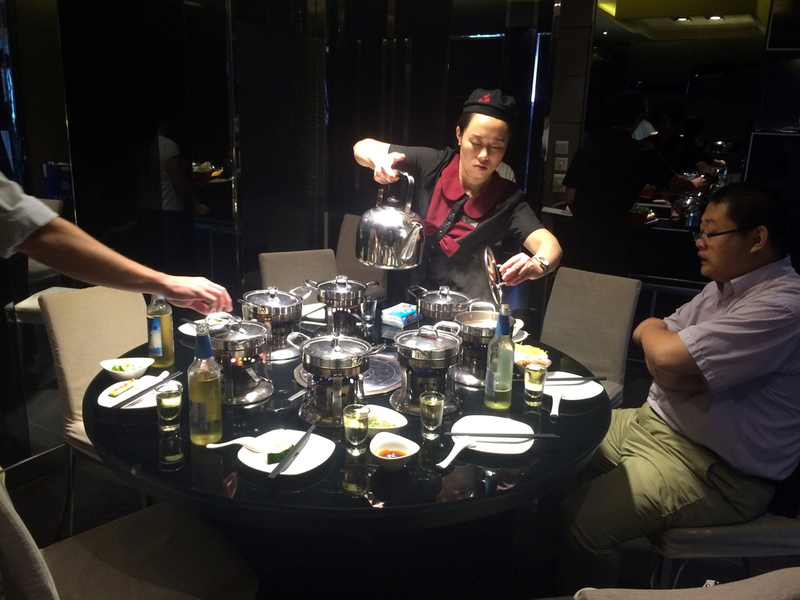 This chicken dish is the beginning of an extravagent lunch on our last day in Shanghai. The chicken is always served with bones and skin, unusual for an American (unless we're talkin about fried chicken). Eating this was difficult for us and we started avoiding it after attempting it three times. This dish was served with peanuts and plum sauce. Eggplant in China is AMAZING. This was the first of many eggplant dishes and was roasted with a red pepper sauce. So many different kinds of tofu in China. This was a firm type with a savory umami mushroom sauce. I like. Cucumber stuffed with garlic and steamed. Such an awesome concept and such a flavor bomb! Inspiration at it's finest. Yellow Fish is a favorite to lots of Chinese and was especially delicious in this fish broth with baby clams and fresh noodles. 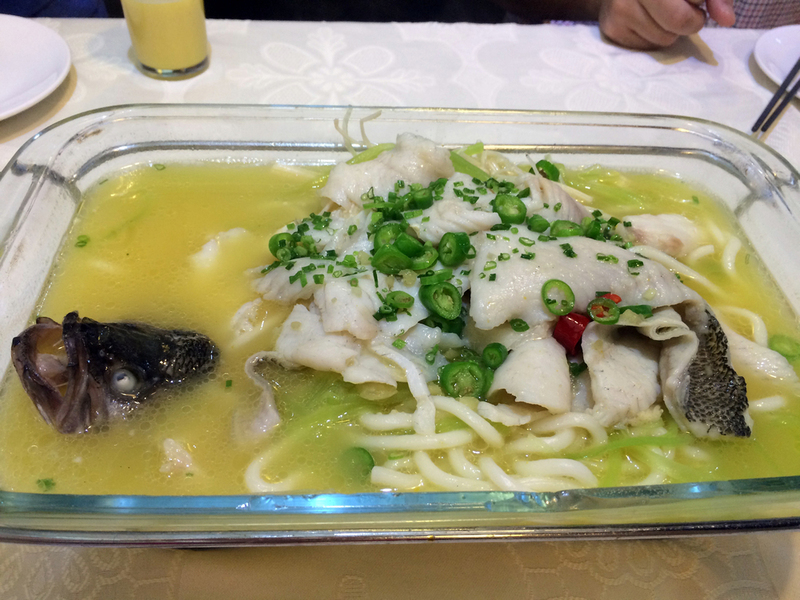 Szechuan peppers cover a massive fish head that is submerged in seafood stock. This was definitely a favorite of all of our hosts, we had it many times and it is delicioussss. Fish heads have the most flavor! 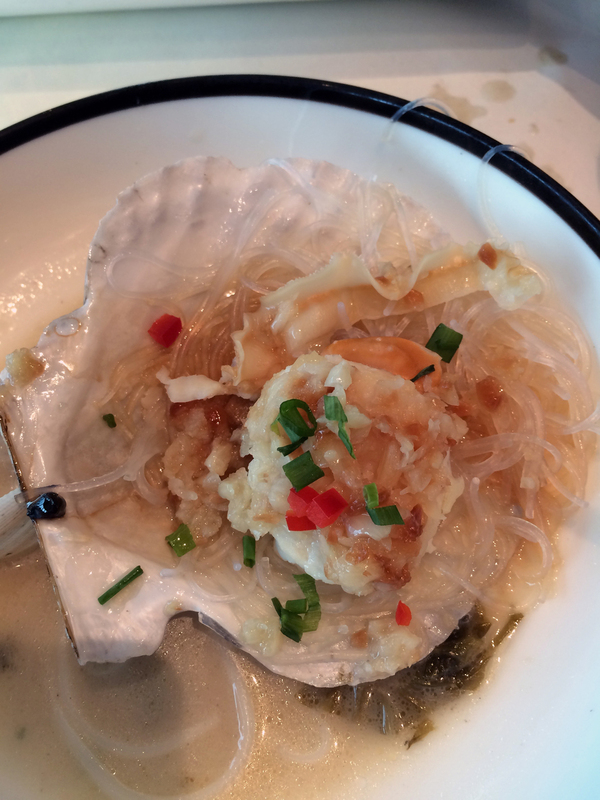 A perfectly cooked scallop on top of rice noodles with a splash of vinegar. So simple and so perfect. Linus and I at the restaurant in Shanghai overlooking the river and the sky line.Our hosts were so generous and hospitable, taking us sight seeing, out to eat and showing us the local culture. Thanks, Linus! Birds on sticks and lots of fried things. Those peppers will either numb your mouth or set your mouth on fire. The peanuts are like crack, though. The buffet at our hotel in Qinhuangdao had DESSERTS. We tried them all, the green melon is incredible as was all the fruit in China. It was like a mix of cantaloupe, honeydew and watermelon. Fried cod balls with quail eggs, roasted garlic and Chinese vegetables. My FAVORITE dish of the trip! I loved this so much and hope to be able to recreate it. Who doesn't like crispy fish!? with Chinese yams and a mushroom broth. Chinese yams are so good. The sticky crisp consistency was fun to eat and perfectly paired with the sweet blueberry sauce. I loved this vegetable dish so much that I ate it all, so I took a picture from the menu book. Crisp and refreshing. I LOVE THESE! They are many layers of crispy, chewy dough. Sometimes with green onion. After trying so many different things, I was always happy to enjoy these to soak up the spices and the booze. 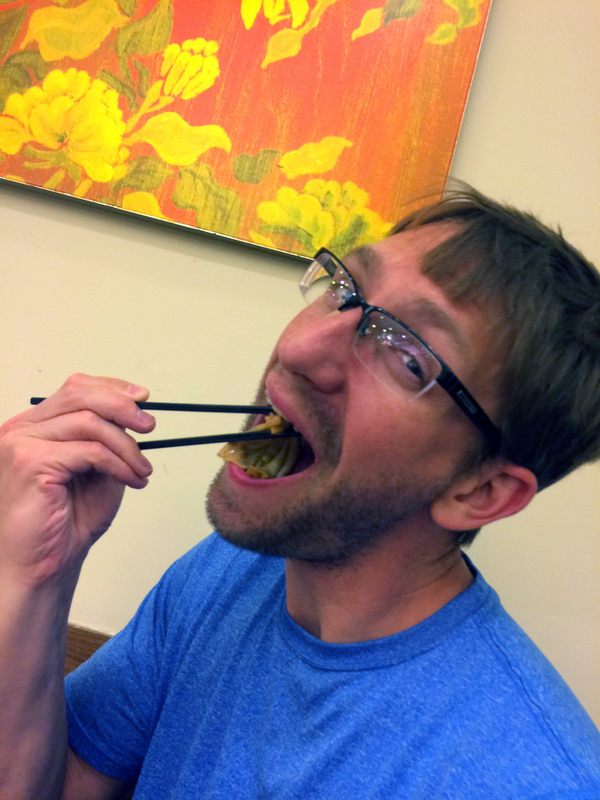 Somehow word got out in each city that I love dumplings, so we had them at every meal! How lucky for me! These were stuffed with pork and Chinese greens, which have sort of a horseradishy flavor. A much needed cappucino from a surprise discovery of a hidden cafe in our hotel. I'm all about tea, but I need that caffeine. 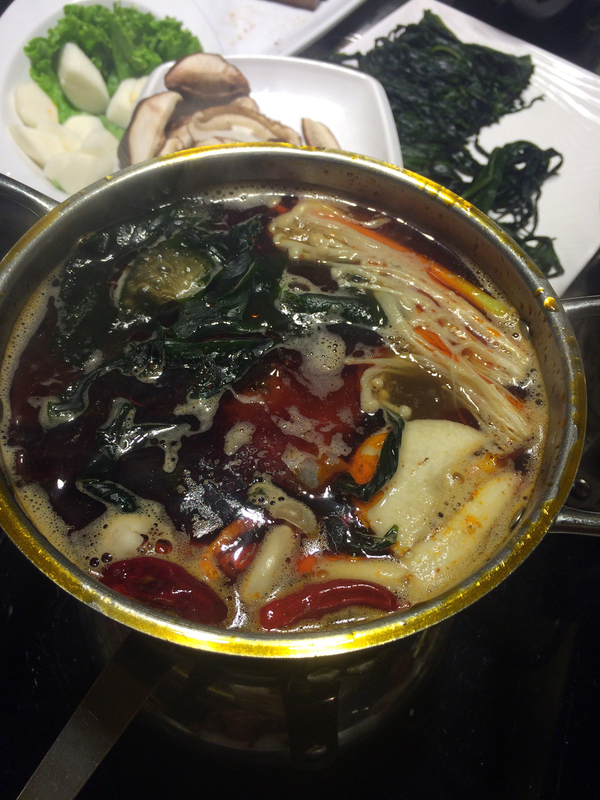 Traditional Chinese hot pot was our lunch in Qinhuangdao. 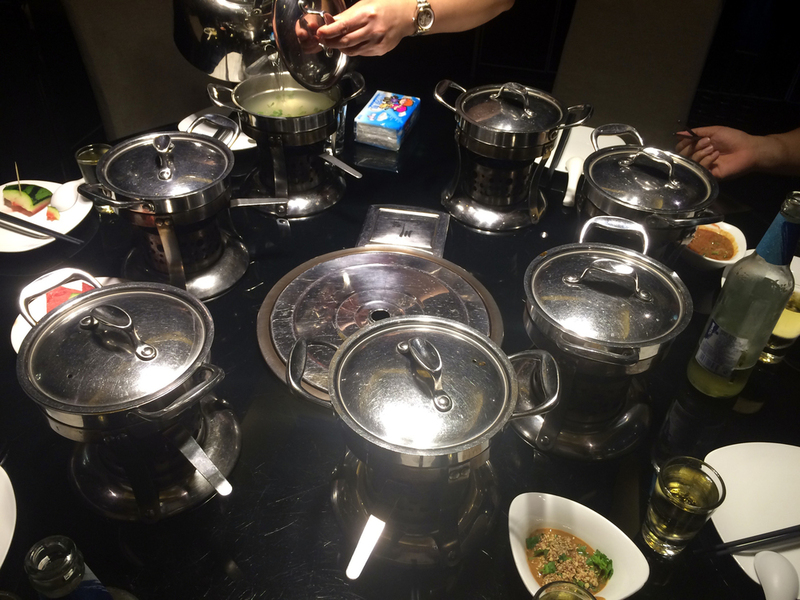 Everyone gets a choice of spicy or not spicy (we chose spicy...I regret it) and you get your own little hot pot. Very similar to fondue. The pots were refilled a few times throughout the meal to keep them full for all of the accoutrements. Numbing and deathly hot. There is a sauce bar at hot pot restaurants so you can create your own concoction to dip all of your hot pot treasures in. I went with a peanut, fish sauce, vinegar, scallion, cilantro mixture. It was bomb. 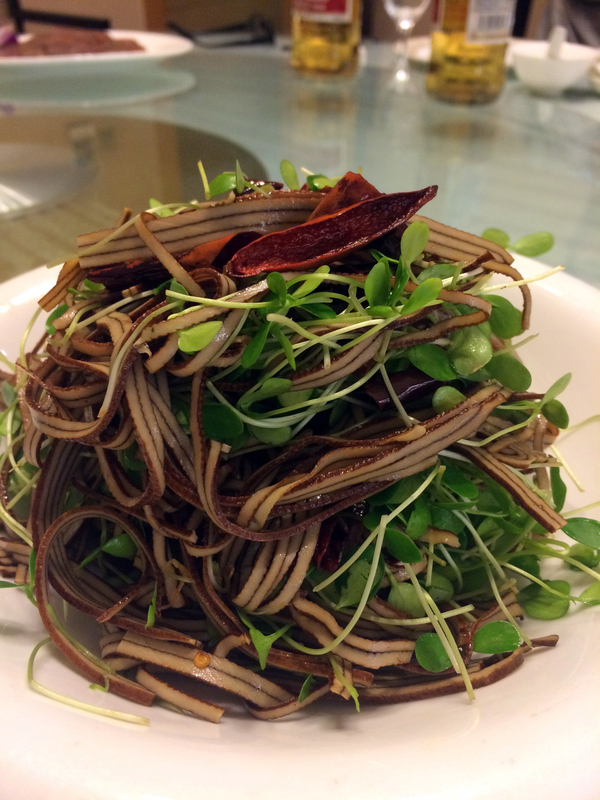 Blood cake, Chinese seaweed, Mushrooms (enoki and portabello), Chinese yam. Meat and vegetables are just constantly being passed around. I just put everything in no matter what it is. Notice the bibs that were brought out just for us... apparently we are a splash hazard. Also I had this nice sweaty glow for the entirety of the meal. You'll notice some beef and lamb on the table ready for the pots. What an awesome hot pot lunch. Our hosts took us to Laolongtou (Old Dragon's Head), the very start of the Great Wall of China at the sea. This dish was insane. I had a bite and figured the strong gamey flavor was from the lamb. QUITE the opposite - those baby greens taste like gamey meat with a hint of anise or mint. I can't even wrap my head around it, it's a mind game and you should all go try it. "A dish for the lady" or so I was told, so I felt the need to eat all of it. 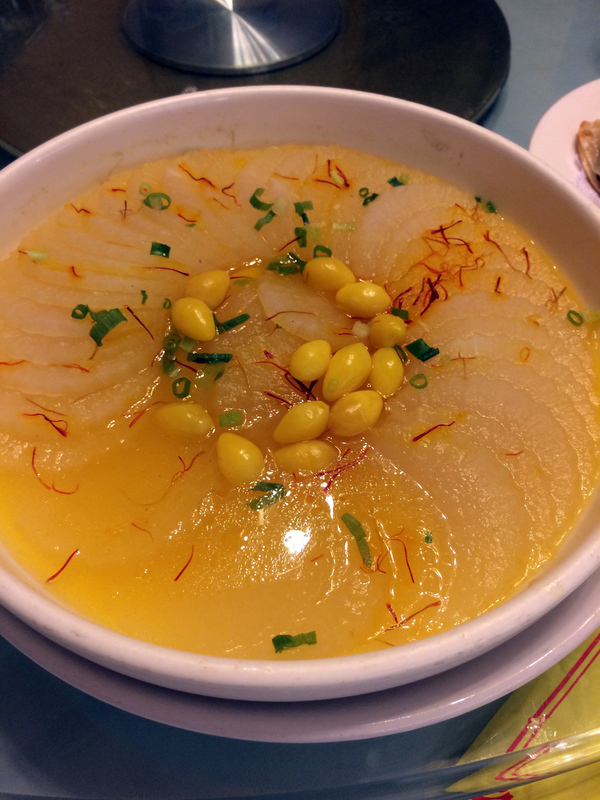 The turnip was boiled slowly with corn kernels (I think?? ), in a corn broth with saffron. I loved this, it was delicate and flavorful, with LOTS of saffron. A comfort food in China, as I'm told. 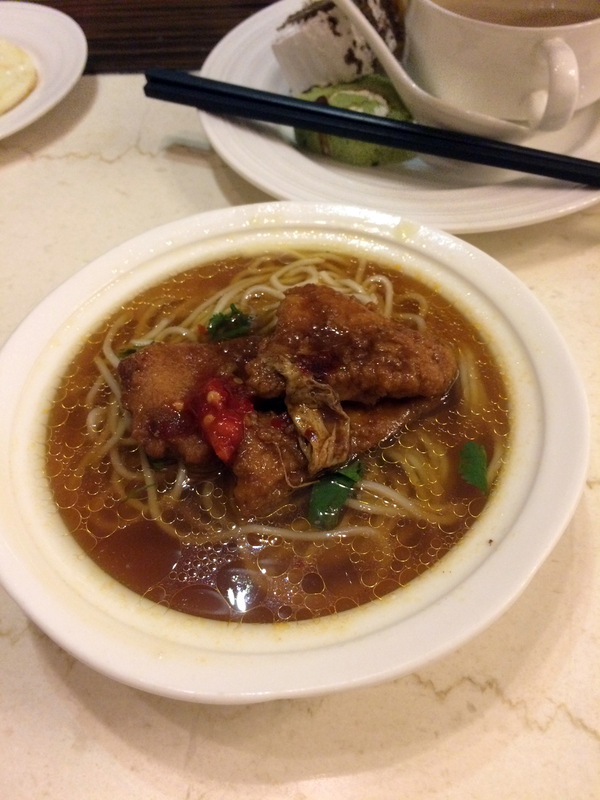 It's warm and satisfying and reminded me of chicken noodle soup. This tofu was very soft and slippery. 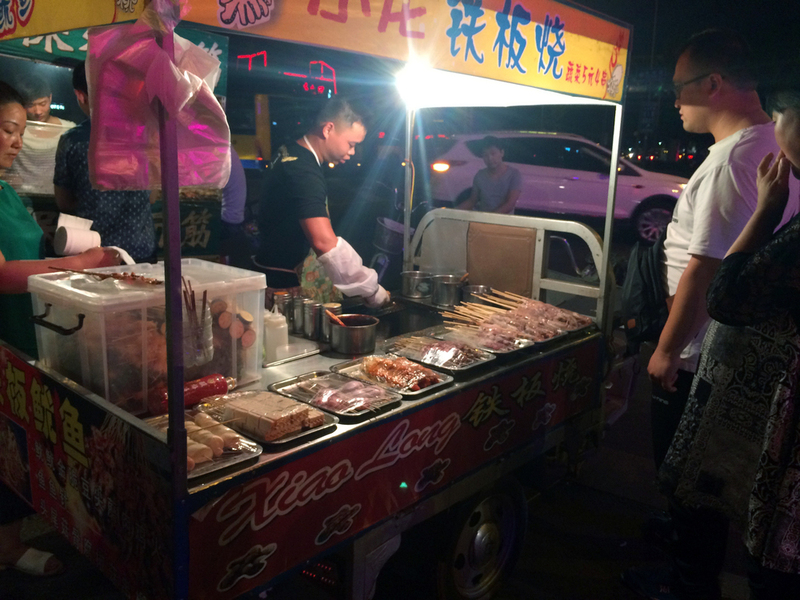 Fried dumplings graced our dinner in Qinhuangdao on this fine evening! 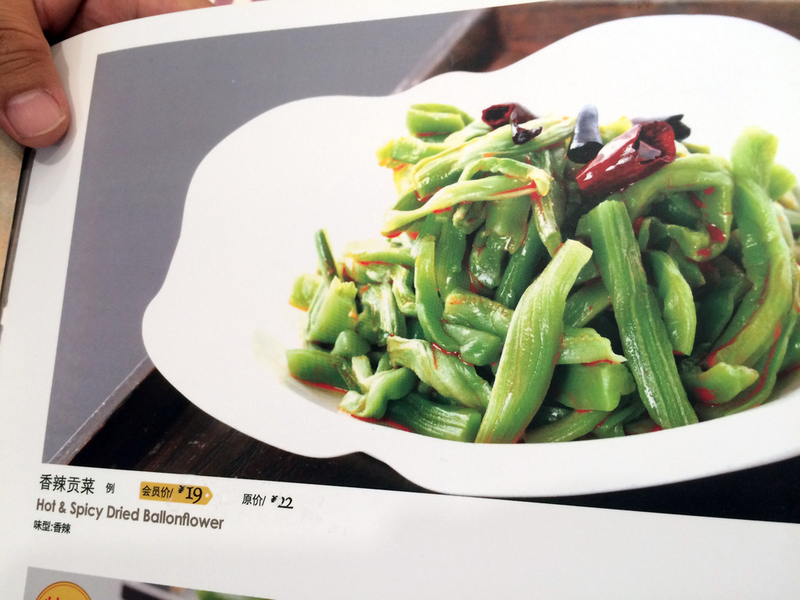 Filled with Chinese green beans and happiness. Yes, the tongues from ducks. You hold on to those two wiry ends and pull the meat off of the tongue with your teeth. I'm a fan of tongues. 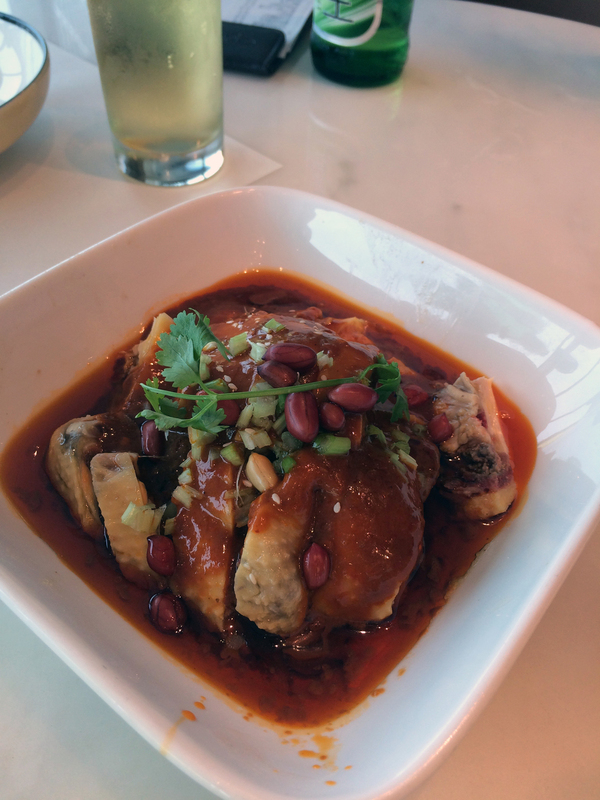 More Szechuan Fish Head Stew! The red peppers symbolize power and luck (red is the color of China), so the stew is covered with them and you remove them revealing the tasty fish underneath! The noodles are for dunking in the fish head stew, and there were of course more dumplings :) You'll also notice the crispy pancakes of the gods... many layers of crispy dough and green onion served hot and right into my belly. My favorite thing to do when I travel is go to a grocery store! Look at all these beautiful fruits! 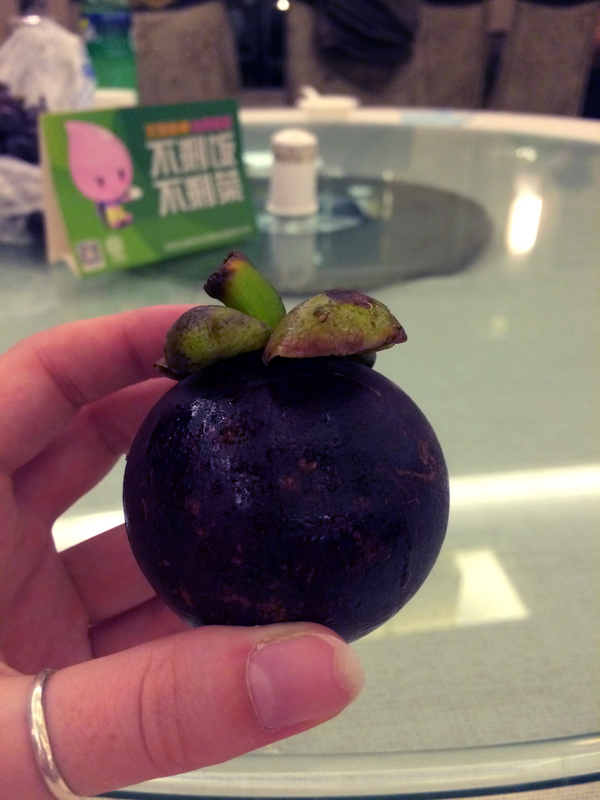 I am obsessed with mangosteens and hope to be able to find them here soon. 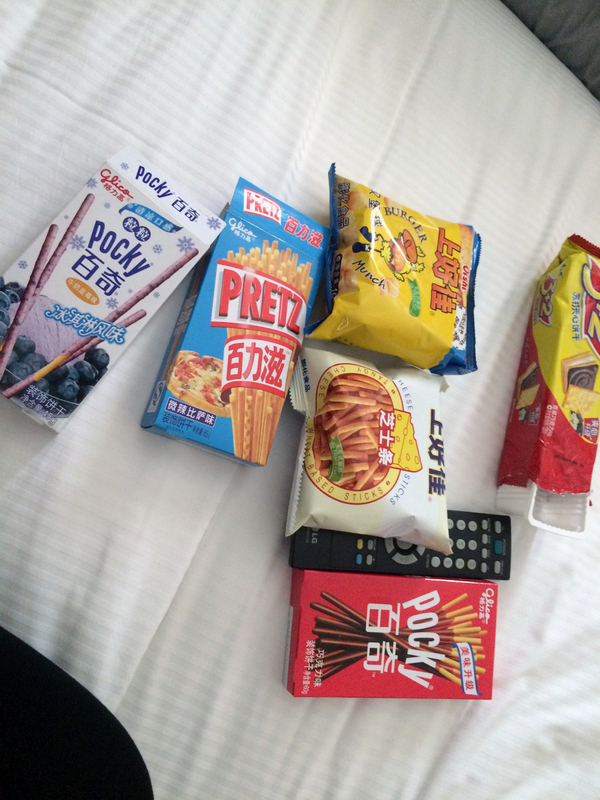 I LOVE Pocky's -- they had blueberry ice cream flavor. yum. Some Hamburger flavored chips that were in the shape of a burger, s'more crackers (a bf pick and they were gross), and cheese crisps (weird and crispy noodle like)! Our final stop was Beijing. This is roasted eggplant with cilantro and it was SO good. I have already looked up how to make this one for you all because everyone must eat it before they die. I ate this whole plate, and the one the next night, and the night after that. Sorry not sorry. Imagine marinated hearts of palm -- it's like that but better. OF COURSE! Some pan fried ones this time, filled with the Chinese greens and the others filled with pork (my fave). You'll notice the bubbly pot that has fermented/smoked trout -- it was so delicious and our host, Bo's (pictured), favorite from his home town! 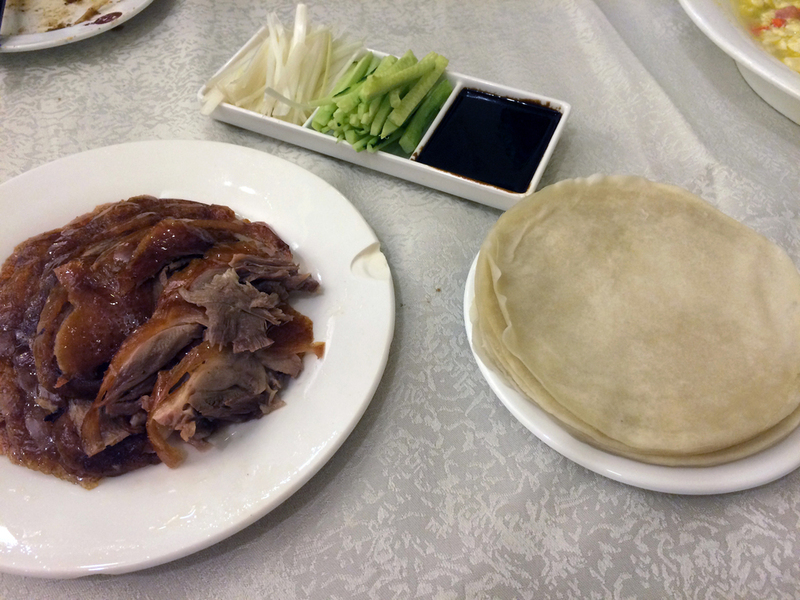 There is also sliced duck with a fish sauce/vinegar dipping sauce that I loved. Boyfriend goes in for some trout while sipping his Pawpaw juice.... not good. I kept referring to this as Christmas lamb because of how beautifully it was presented (note the red color again). This was epically hard to eat in a civilized manner, so I just went all in with my hands and face and had the time of my lamby life. I sang that phrase the whole day at the Forbidden City. This was SO beautiful, it is stil in it's original state from the Ming Dynasty and features glazed tiles to make up 9 dragons (dragons are a symbol of power and good luck). 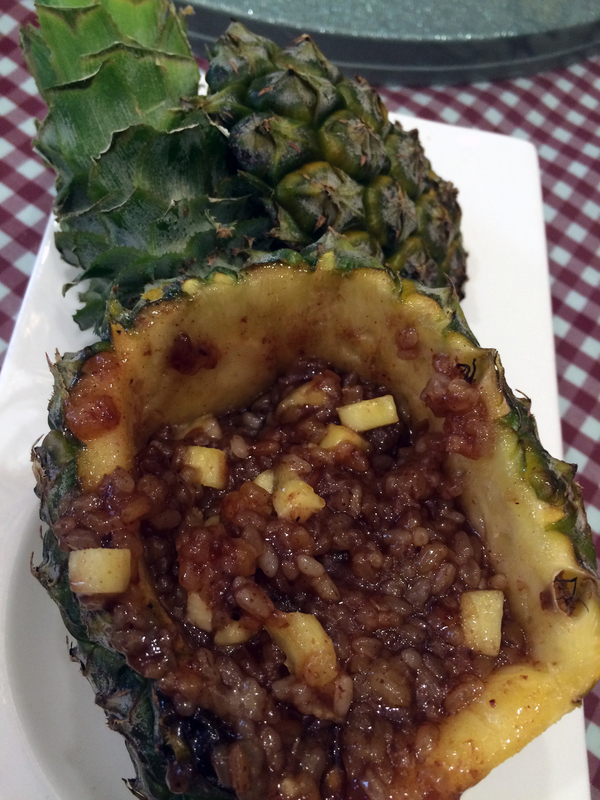 Ok you guys, this was by far one of the weirdest things we ate. We told our host not to tell us what things were until after we try it. After a few bites, I was pretty sure there was some intestine involved. I was right, this is DONKEY intestine, liver, heart and meat (no clue where the meat was). We were at a local restaurant that was very small and common in Beijing. Each day the owner cooks a huge pot of one thing. This day it was donkey! 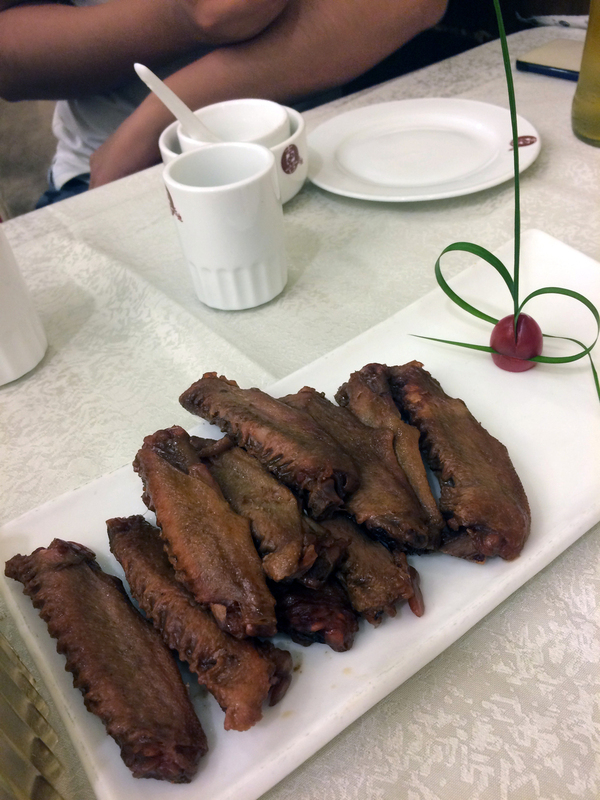 Our translator informed us that Donkey is the second most heavenly meat to eat in China. The first is Dragon but apparently you can only get that in heaven...pshh. The broth was flavorful with fresh herbs and donkey stock. I actually enjoyed this, but am glad I was unaware of what I was eating. Also it was 100º out. Those are pupusa like dough pockets in there! Those were tasty. Yes, that is the intestine. Lots of fermented and salted items that will keep in the hot hot heat. Dinner this night was SPECIAL! 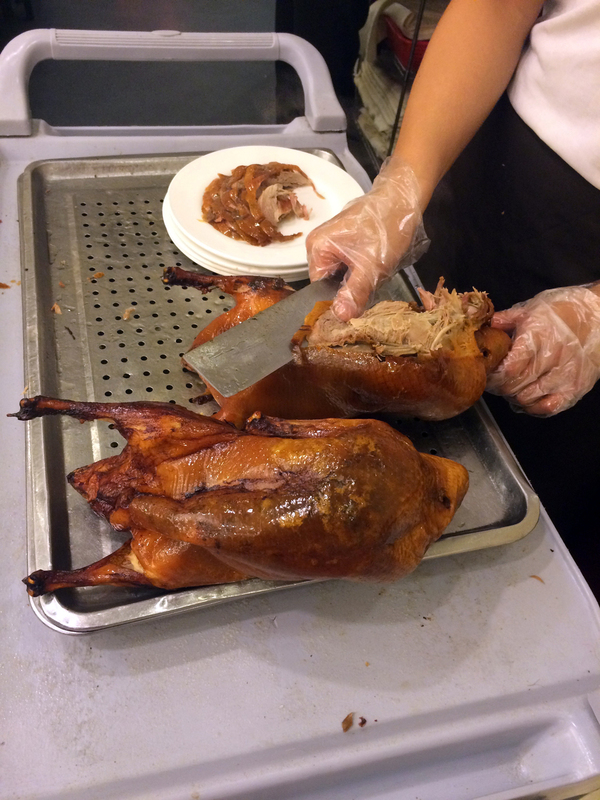 Our very own Peking duck! The chef prepares it table side. Basically the same as in the U.S., but PEANUTS. Smoked and deliciousss. I'm still a sucker for a crispy buffalo chicken wing, though. Basically heaven on Earth. Tempura battered whole shrimp stuffed eggplant. Tim and I ate this whole plate in under two minutes. Freakin delicious. These are a few of my favorite thingssss. Dunk the duck in the hoisin -- a LOT of hoisin as our hosts recommended -- put in some veggies, put in the really really thin pancake (don't fill it too full! ), wrap it up and eat it in one bite! This was so fun! The skin was so crispy and fatty and delicious. The chef takes what's left of your duck and deep fries it! This was so tasty, finding the little morsels of duck meat all crispy and fatty...mmmmm. We climbed the Great Wall of China! It was so hot and so steep, but absolutely beautiful and breathtaking. The whole time we were sightseeing our hosts told us that we really needed hats -- most people have umbrellas, hats or UMBRELLA HATS. After about the tenth time of the hat comment, we stopped at a small market to get some. Everyone was very involved with the hat choosing decision. My original hat was immediately shot down and Tim was forced to get a communist hat. The pink hat became the winner with a giant bow on the back, so there you have it -- Chinese hats, perfect for shading our white faces. I should also note that we were stopped at least ten times for people asking to take their picture with us. Many people have never seen an American before! It was like our own personal paparazzi! Another fun fact, everyone will stare at you if you put sunscreen on. Eggplant in red pepper sauce with black fungus, steamed cabbage andddd DUMPLINGS! 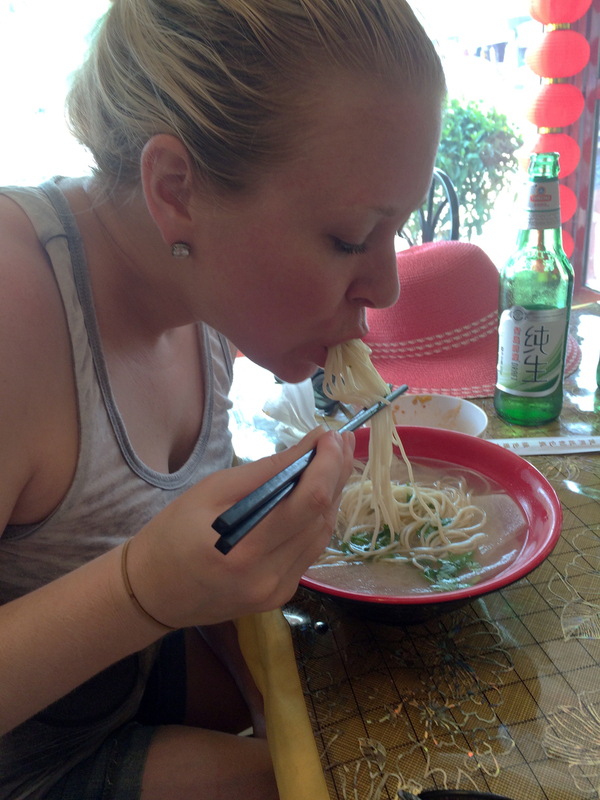 Very similar to pho and sooo delicious after a very long, hot and steep climb. There are also white carrots in there! These are your typical Beijing grapes! They are so grape-y tasting! Also, it was 100º so I am covered in sweat. I must have been too tired to capture all of the dishes, but this was a tower of Chinese greens (like spinach), mint, cilantro and edamame. I loved this. Much needed after so many heavy meals. It's like a soft, fleshy citrus fruit. The texture is so amazing, creamy but still bursts with a sweet and citrusy juice, similar to a kiwi with a little strawberry mixed in. Let's grow these right meow. House made noodles and made-to-order noodle bowl for one please! I will miss noodles for breakfast. At the airport waiting to return to DC, we couldn't fight the feeling anymore and indulged in some Pizza Hut!